Had a lazy morning in before catching a red double decker into London Bridge where we discovered a lovely little spot for lunch tucked away next to Southwark Cathedral. Great paella. Then off to the Globe for “As You Like It”. Really enjoyed the performance. They try to stay original to Shakespeare (except that there are female actors) and have one actor doing multiple roles and the gender of the actor does not represent the gender of the character – for example the female character of Rosalind was played by a male and that character then pretended to be a female. 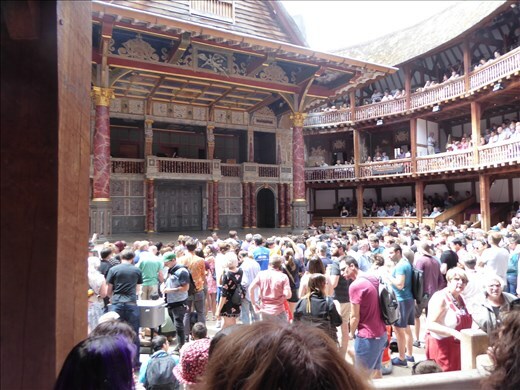 The audience was enthusiastic and joined in where appropriate – all in all an excellent experience. Made our way back along the river to the Golden Hind – a recreation of Sir Francis Drake’s ship which is currently in dry dock for repairs to be made seaworthy again. Last time we were here the ship was not accessible, but we were able to do the tour this time. The guide was great, and I now understand why they made such a big fuss of Francis Drake. On our way back to the bus we stopped at Southwark Cathedral – a lovely Cathedral but what made it was the 12-person choir practising. Had a great night in with Carole -and we had roast – yum!